Recently the New York Times published an article covering the debate in Texas over the potential ban on gassing rattlesnakes. Unfortunately they did a terrible job. What follows is the long version of our letter to the editor in response to this article (what we would have written if letters weren’t limited to 150 words). 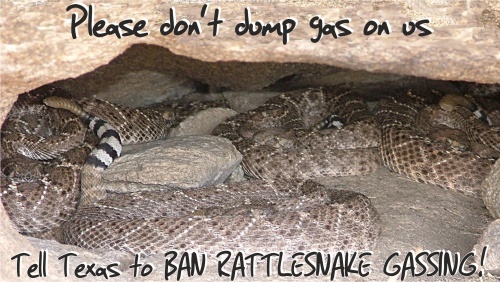 In his article, “Rattlesnake Wranglers, Armed With Gasoline,” Fernandez presents one side of a debate over the proposed ban on gassing rattlesnakes that is biologically inaccurate and ethically compromised – this piece reads like an advertisement for roundups, rather than journalism. Western diamond-backed rattlesnakes do not infest the southwest; unlike rats in NYC, rattlesnakes are native and their populations controlled by well-understood, natural processes. I live in Arizona, home to more rattlesnake species than any other US state and stricter hunting regulations than Texas (4 rattlesnakes may be taken per person, per year). There are no roundups here, the state is not overrun with snakes, and ranchers and others manage to coexist with snakes. Characterizing rattlesnakes as a scourge that exists to “bite and frighten ranchers and others“ is a villainous misrepresentation. Rattlesnakes do not intentionally terrorize people; after avoiding and warning, the last thing a rattlesnake wants to do is put their head into contact with a potential predator. In the US, snake bites, though painful and expensive to treat, are relatively rare (less than 0.003% of people are bitten in US each year), almost never fatal (one in 50 million), and usually caused by the alleged victim handling or attempting to kill the snake. The threat posed to humans by rattlesnakes is relatively small: more people are killed by lightning, dogs, and of course automobiles. From: Frequently Asked Questions About Venomous Snakes, UF Wildlife – Johnson Lab. Like all native wildlife, rattlesnakes play an important role in the environment as predator of small mammals, reptiles, and birds, and prey for other snakes, predatory birds, and mammals. Although humans have a history of eradicating animals that compete with or threaten us (wolves, grizzly bears), this practice is generally frowned-upon today as we have a greater understanding of the importance of predators in the environment. Hunting rattlesnakes and other wildlife is already regulated in Texas; the proposed ban on gassing is not a new regulation, but an amendment that would prohibit the use of noxious or toxic substances to disturb or collect nongame wildlife. It is perplexing that using noxious or toxic substances is currently a legal method of collection in Texas. By definition, these substances are toxic to the environment and all who inhabit it, including humans who depend on groundwater that these substances may leach in to. The proposed amendment is really more about protecting the land and other wildlife, than rattlesnakes. As someone who grew up in rural area with limited economic opportunities, I sympathize with the communities who depend on these roundups as one of their most important sources of revenue. But supporters of the proposed amendment and opponents of traditional roundups are actually not calling for an end to all rattlesnake roundups and the money they provide. What we’d like to see is more communities follow the example of Claxton, Georgia. After more than 40 years of holding traditional rattlesnake roundups, Claxton switched to a festival where no animals are collected from the wild, tortured, or killed, and the new festival has been more successful since they made the switch two years ago. People are fascinated by snakes, not the atrocious display of animal cruelty. I think the Sweetwater Jaycees and other roundup organizers would find most roundup opponents more than happy to volunteer their time and expertise to facilitate transitioning these events to wildlife-friendly, no-kill, educational festivals. I am not a city-slicker who would be horrified to have rattlesnakes in her yard, as roundup proponents are fond of saying. I grew up in a rural area of the southeastern US before relocating to Arizona. Recently I lived on a nature preserve where we observed hundreds of rattlesnakes right outside our homes and office. For more than two decades people have lived with these snakes, without killing or removing them, and there have been no bites. If you talk to most people who live in the rattlesnakes’ world, you will find that they learn to watch out for snakes, because this is the only sustainable way to coexist with these fascinating, but terribly misunderstood and maligned animals.